Ten tellers will have 6 minutes each to share a story based on the theme "Grow." Sign up on TheStoryline.org March 23rd through April 20th to tell a story. 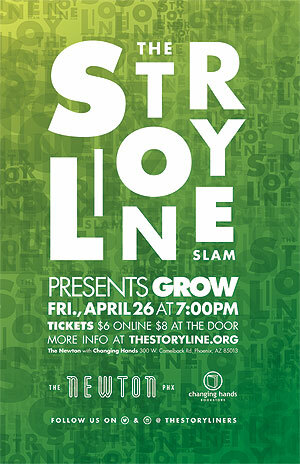 Eight names will be drawn on Sunday, April 21st and posted on the TheStoryline.org SLAM lineup page. Two more names will be drawn live at the beginning of the show.